I have been following Gazelli Cosmetics ( beauty brand originating from Azerbaijan ) emergence and progress on the British beauty market pretty much since its launch at Urban Retreat Harrods and have to say that for such a young team they seem to be doing a pretty impressive job. Having reviewed their face skincare in the past I was delighted to hear that they became part of Josh Wood Atelier in Notting Hill and now offer not only their facials, but body treatments as well and was a keen volunteer to experience what the team have in store for their customers. The location of the Atelier, in a quiet muse area, almost instantly relaxes you ( not that you don’t feel the energizing buzz that you see through the glass doors where the hair salon area is ). I arrived on a sunny, breezy morning nursing a somewhat blocked nose after my recent travels but deep inside I just wanted to relax my body, even though the end result could have played up against me ( in general it’s ok to have a treatment if you have a cold from the neck up, but if it has spread to your throat etc, it’s best to re-schedule ). I was met by a petite glossy-haired therapist with beautiful Bambi liked eyes called Sam who led me to the top floor of Atelier. With white walls, wooden floors and artful accents dotted around, the atmosphere is relaxed yet comfortable, as if you came into a friend’s home, rather than the salon. Gazelli’s treatment room is vast, with high ceilings, cosy armchair and a large window draped with heavy curtains ( which fools you into losing the sense of time, as you can’t tell what time of the day it is outside, so you can properly shut yourself off and relax while in-treatment) and stylish cupboards, creating a laid-back yet chic boudoir-like feel. Sam sat down on the little round floor pillow, by my side, as if I was her Arabian Nights Princess, and we went through the questionnaire that I filled in, as well as aches/pains that might be nagging me, medical conditions, if any and massage pressure preference. Sam explained the treatment to me and left, allowing me to get undressed and get under the cosy covers of the warmed-up treatment bed. She left me with a little tasselled car key-like gadget, that I was to press to let her know I was ready – modern element of sci-fi gadgetry that adds a charming touch, preempting the treatment. Gazelli therapist works barefoot, allowing the treatment to be minimally disrupted by sound, so to start with I could only hear the barely there whoosh of the humidifier in the room and subdued musical notes of the music whispering at you through the sound system. You lie almost naked, apart from your bottoms, on the heated bed and the therapist starts by stretching you gently, before skin brushing you all over. The most surprising element of this well-known lymphatic drainage technique is that the movement of body brush is followed by the soothing hand movement, gliding over your skin. This human touch element makes body-brushing a sensual pleasure and I tell Sam later that I will definitely be doing it in the same way at home. It allows you to speed up lymphatic drainage and re-engage with your body, as human touch is proven to have multiple benefits for the body, as well as our mind. As soon as body brushing is completed ( the only area where it’s not down is your breasts ), Sam asked me to sit down and started spreading a warm Gazelli body mask ( it contains warming cinnamon spice, geranium and White Oil from Azerbaijan, a core ingredient of Gazelli skin and bodycare ( for now body products used are for professional use only ) on my back. The texture feels like a body oil mixed with soothing, yet rich body moisturizer and your body drinks it in hungrily, after the dehydrating effect of winter weather on our skin. The body mask is applied all over and then you are wrapped in a crisp cotton sheet and covered in a warm towel. By that stage of the treatment you will start struggling to keep your eyes open. The next stage of the treatment, while your body and skin are being nurtured by the mask, is for the therapist to give you a head and neck massage, which had surprising elements to it as well. Sam not only gently pulled my hair but the massage movement of the head was wave-like – upwards, as if zoning up your head and treating it in layers. The sensation was also similar to holding a balloon and gently squeezing it-it is thoroughly relaxing and I was grateful for some quite steps and a tingle of laughter outside the treatment room, as I was truly trying to bring myself into now, as opposed to blissfully dozing off. My willpower was certainly exercised at the highest level by the time Sam got down to massaging my feet. With the time required for the mask to work complete, Sam seamlessly ( how did she make sure the towels were warm and wet ? ) helped me sit up and started applying the towels initially to my back, further soothing the muscles and taking the excess of the mask off, and then proceeded to do the same with the rest of my body and almost like a magician taking the sheet, in which I was wrapped, right from under me. Your skin is also ‘tap dried’ by another towel, so your skin is warmed-up but dry and ready for the massage that awaits you. Sam applied warmed up White oil to her hands and then proceeded to massage me, starting from the back ( as I prefer the strong massage, Sam beautifully obliged and delivered just the right type of pressure for my muscles to come alive from slumber and toxins and tension encouraged to leave my body of its own accord ), and fluidly progressing to my shoulders ( in my case that’s the area where I gather most of my tension-side-effect of scribbling down notes and typing on the computer daily. At times I winced in discomfort-it actually showed Sam skills as therapist, as she managed to un-knot tight muscles and I felt relaxed and not at all sore when I left the treatment room – no pain, no gain, says an old Russian proverb ), legs ( individually ), bottom and sitting muscles ( that we all overuse ) and arms and hands, one by one. While doing the massage Sam also stretches you in opposite directions and does a very effective massage technique when she glides her hands in opposite direction from under your knee caps, speeding up drainage and stretching your muscles, leading to less soreness and more effective circulation all over your body-particularly effective after a long, cold and damp winter. Another point that sets Gazelli body treatment apart from others is that you also get a stomach massage. Sam put her hands gently on my belly button, fluttering ever so delicately over it, a sensation not dissimilar to that of butterfly wings above the flower, for a few seconds and then massaging my stomach area all over, in clockwise motion. She started with a gentle notion and then the massage became deeper and more vigorous, stimulating the liver and colon to move the waste more effectively and offering less gut stagnation that can lead to bloating and other stomach discomforts. This is followed by some more massage in your upper chest/neck/shoulder area before a dewy mist is sprayed over your face and the treatment comes to completion. Sam left, asking me to take a few deep breaths and not rushing to get off the treatment table. When she came back she brought me a big glass of water ( mid-way through the treatment I started feeling thirsty and due to the effect of the treatment I was told by Sam to make sure I upped my water intake that day-cue my excuse to drive to Roots & Bulbs later and stock up on their toasty tasting coconut water ). Sam’s calm demeanour and strong hands make her a perfect therapist ( she used to work for Bliss and Elemis ) and the treatment is one of the most enjoyable body treatments I have recently had in London – perfectly timed and executed, with every aspect of it considered from the point of view of maximising well-being benefits for the client and making it seamlessly relaxing. The whole treatment combines traditions of Muslim beauty culture with modern massage practises. I was surprised that my head was clear, I feel energised but completely at peace and that I could actually breathe through my nose ( it almost started to drip during the treatment, possibly due to gravity and my head looking down on the towelled floor underneath the treatment bed ). The rest of my busy day was spent in calm harmony, with focus and not a sore point in my entire body -a veritable triumph of skill, research and ambiance fused with beauty and distilled into Gazelli products, leaving you with the softest skin post-treatment as well. A true temple of bodily bliss, if you ask me ! Gazelli Cosmetics luxurious Body Refining Treatment at Josh Wood Atelier lasts 90 minutes & costs £145. Its main aim is to stimulate, exfoliate/firm/tone and moisturise your skin. What a blissful sounding treatment! 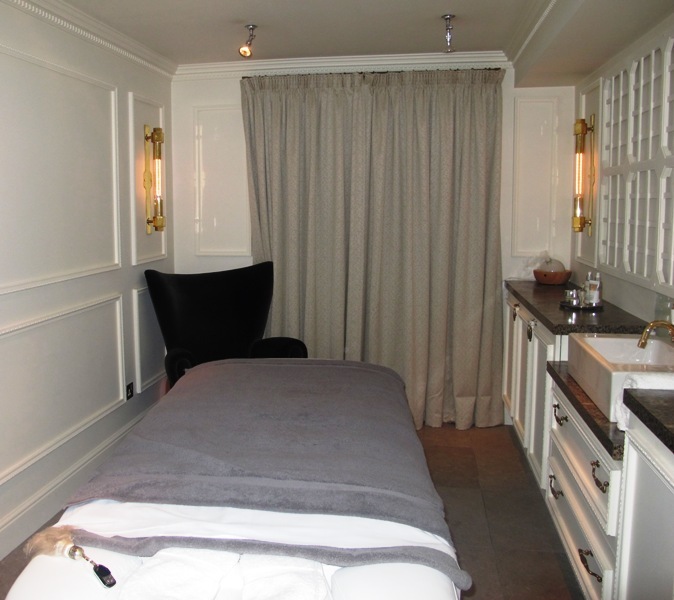 Having enjoyed a Gazelli facial recently I know just how comfortable and relaxing their treatments are. I’m very much looking forward to having a massage at Atelier, as like you I spend far too much time working at a computer. We are so thrilled you enjoyed your treatment Galina and welcome you back to Gazelli’s treatment room any time. We hope you continue to feel rejuvenated and thank you for this wonderful feature.